"Isn't the thing supposed to be doing its thing about now?" [TO HERSELF] "You know, I'm responsible for a lot of things but the safe and proper operation of the Earth's Moon is not among them." "At The Sound Of The Tone, Your Mission Is..."
These past few weeks, I get a call or text every morning around seven, to tell me if there will be any work aloft or not that day. Most days, not. At nine hundred feet above ground, ice lingers, winds are stronger, and everything you do takes five to ten times longer than it does on the ground. In the winter, when it's sunny, it's often cold: if there's no cloud cover overnight, everything cools down and it stays cool. On warmer days there's often a front moving through, which means it's at least breezy at ground level and more so at any great height. And so, every morning, a text. Or a call. The newsies and Internetters seem a bit excited over the upcoming State Of The Union speech. Me, not so much. Historically, I'm not alone. The majority of SOTU reports have been handed to Congress in written form like so many schoolboy essays. After George Washington, the next President to call both houses of Congress together and give them a talk about how things were going was Woodrow Wilson, who assured them, "The country, I am thankful to say, is at peace with all the world, and many happy manifestations multiply about us of a growing cordiality and sense of community of interest among the nations, foreshadowing an age of settled peace and good will." Less than eight months later, World War One began. By the Spring of 1917, Mr. Wilson and Congress joined in. Cordiality was set aside for the duration. The modern State Of The Union is a talk by a guy who -- no matter his party or ambitions -- does not make laws, who must hand his treaties over to Congress to decide yea or nay and who manages -- if he is lucky! -- to stay barely even with national and world affairs. It's a speech from someone riding a bull, trying to assure Congress and the country that everything is, if not well, at least headed that way. It's a brave and very human effort, but the content means much less than the tone, and the tone is well-nigh predetermined. An age of settled peace and goodwill will be foreshadowed. Mr. Trump will make his speech and the people who favor him will declare it remarkable. The people who don't like him will compare it to talks by various infamous dictators. 21st-Century politics as usual. They Do What With Zucchini? I've been seeing them in the produce section at our corner grocer's for a few months now: long, skinny strips of carrot, yellow squash or zucchini. They're meant to be a low-carbohydrate replacement for pasta, but really, now -- can that be any good? Finally, I had to try. Tam's doing low-carb and I didn't want to give up on the occasional treat of a spaghetti dinner. Eggs Pomodoro is wonderful, but sometimes you'd like a change, no? So I bought the stuff. Just in case, I made Bobbi's Overkill Sauce. It starts with a half-pound each of ground sirloin and sweet Italian sausage, mostly cooked and drained, then finished with a nice onion and plenty of fresh mushrooms, to which I add a bottle of whatever spaghetti sauce looks appealing. Newman's "Sockarooni" kitchen-sink version is surprising tasty, even compared to the high-end gourmet stuff, but use whatever you like. The end result stands on its own. There are several ways to cook vegetable "noodles," none of which are much like boiling pasta in salt water. I opted to saute it for a few minutes; a non-stick skillet and a half-teaspoon of olive oil ensured it wouldn't stick or clump. After five minutes, it was indeed al dente and with the sauce ladled over, it looked like the real deal. It's good! The taste is not quite the same as traditional spaghetti. It may be better -- zucchini can become bitter in cooking but the quickly sauteed version has none of that, just a nice, mild vegetable richness that complements the sauce. Mouthfeel is like good spaghetti, and not at all slimy the way cheap pasta can be. Tam and I are not going to have to give up spaghetti. If you've been looking at the stuff, wondering, give it a try. This is a setup that in different hands could be genuinely dreadful, a swamp of pulp cliches. Not in hers. Zenna Henderson was a lifelong teacher, usually in rural elementary schools; she had a deep affection for the best of small-town life and it permeates these stories. She was also a gifted writer of understated prose, with an fine eye for just how much to leave unsaid. The People are, by and large, genuinely good and a typical Henderson story has them overcoming adversity, rediscovering their past and/or helping others -- as if The Waltons could levitate and do a little mind-reading (etc. ), while being careful to not get caught at it. They're also genuinely, if somewhat ecumenically, religious, presented in a positive way rarely encountered in science fiction. I suppose they could be considered a bit sentimental -- but far too much SF has no heart at all, or only a tritely bloody or bleeding heart. Hers is neither. Henderson's tales are far back from any front lines, mostly between the wars or riots, set with the healers, home and hearth. She finds plenty of conflict there. Most of Henderson's work was published in a few paperback collections, now long out of print but still available. A few were only published in SF magazines, or not at all -- until Ingathering was published in 1995. I started reading near the end, past the stories I had already read and enjoyed, and so arrived at Shadow On The Moon (1962). The plot is not too dissimilar to Robert A. Heinlein's Requiem, and yet the story she tells is very different. I recommend it, and won't go into details lest I spoil your enjoyment. I've been reading Lawrence Block's Telling Lies For Fun And Profit, a collection of his Writer's Digest columns that Sue Grafton is said to have re-read before starting each new "Kinsey Millhone" novel. It's all good stuff. He's an excellent teacher. He uses his own work for examples -- which saves anguished conversations with authors who don't agree with your assessment of their work -- and that has led me to his "Evan Tanner" books. Tanner is a kind of inadvertent spy, who happens to have a rare condition that keeps him from needing sleep. He speaks dozens of languages and is fascinated by political "lost causes" of all types. Fun reading, perhaps a bit light, but for anyone who's been around conspiracy theories, it's pure candy. Tamara was given a bag of Tanzanian Peaberry coffee for Christmas and we recently discovered it was ground coffee, not beans. Whole beans have longer storage time than ground. I've been working through some excellent Jamaican Blue Mountain (thanks, Dave! ), grinding the beans as needed. We shelved that for later and started in on the Tanzanian before it went stale. That meant a rare opportunity to compare the two. Tanzanian Peaberry holds its own. While it doesn't have the tastes-just-like-it-smells characteristic of the Jamaican, it is very good, with a nice flavor and a smoothness that makes it eminently drinkable. A fresh pot vanishes with astonishing speed! "Peaberries" grow as single, roughly spherical seeds in the coffee cherry; most coffee beans grow as doubles, producing the familiar flat side/round side shape. Peaberries are sorted by hand, and between the extra care in sorting and the round shape (said to aid in roasting), peaberry coffee and regular coffee from the same variety taste different, with peaberry generally ranked better. There are at least two different kinds of coffee grown in Tanzania -- one of them, Gesha or Geisha,* is an Ethopian c. arabica variety† currently among the most expensive coffees in the world. I'm not sure how widely available it is. The other, what we're drinking, is a disease-resistant c. arabica of somewhat uncertain pedigree, either a straight-up typica or French Mission. It's also considerably less expensive than Gesha; you can find it at pretty much average good-coffee prices and you'll be glad you did. * Named for a town in Ethiopia, misnamed for a Japanese professional companion. Y'know, looking at history, Ethiopians have every right to be among the most seriously peeved people in the world. They never seem to get a fair shake, right down to things as simple as the names of coffees. † As a general rule, you can't go wrong with Ethiopian coffees. Sidamo and Yirgacheffe are dependably good. I don't think I have tasted Harar but it gets good reviews. If you grew up reading science fiction, she was always there. Her worlds were not usual sort of thing and neither were her words. Her voice is silent now. Ms. Le Guin passed away yesterday, leaving us a wonderful body of work. You might find yourself disagreeing with her take on things, but there was never any doubt that she'd thought them through. Some time ago, after a (non-Tamara) friend had bemoaned the impenetrable voodoo futility of being asked to submit an outline before writing, I made a terrible mistake: I remarked to another friend that such an attitude was more self-indulgent than real, because "everyone writes to an outline." This did not go over at all well. It would seem that not everyone does. Part of the friction comes from semantics: what's an "outline?" In the high school I attended, academic-track students were required to take "Expository Theme And Research Paper," a course that concerned itself with very rigorous, formal outlines: Unyeilding taskmasters, straightjackets, corsets, traction-- Except like the last three examples, the structure was supposed to be a support, a way of staying on track; the effort of getting this into the unruly minds of teenagers often turned "outline" into a daunting monster, the nemesis of creative expression. And this is the dire thing people think of when you say "outline." It's a very dry sort of writing, taught as a largely mechanical exercise in constructing readable prose no one would much want to read, and it's most likely good discipline to struggle through. I got a D in that class, by the way, though I think I managed to fast-talk and large-vocabulary my way to a gentlewoman's C at the very last moment. Other writers begin with no more than a character and/or a situation -- Mary Wollstonecraft Shelley started Frankenstein: or, The Modern Prometheus with no more than a nightmare. And that's an outline of sorts, too. I struggle with plots and my work and leisure activities often interfere with long uninterrupted writing sessions; the reins slip from my grasp. Having a better idea where I was headed helps me get things back on track. Taking writing classes when I can, what I'm learning is there's no one good way to write; people tend to be "plotters" who get the broad brushtrokes down first, or "pantsers," who let the characters and situations develop the story -- but nobody is all one thing. Know your own process, and don't kid yourself; "freewriting" is fun, but it's work, too, precisely because it is so very difficult to not be steering, if only a line or two ahead. Outlines aren't hairy, bearded monsters, just waiting to grab, they're trails -- some very faint, nearly invisible, while others are like iron rails, strong and inflexible. Most are somewhere in between. Maybe you don't have one. Maybe you do. I don't know. 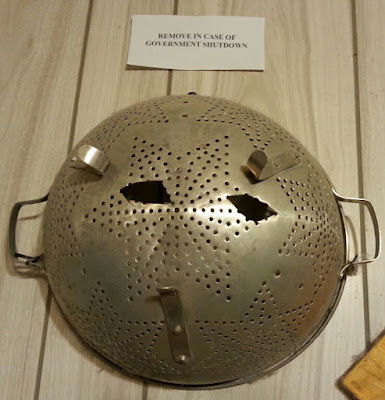 No sooner did we get out the colander polish than Congress decided to keep the Federal government running for another three weeks. Just in time for a tsunami! The Federal government has shut down and only the "essential functions" of the IRS will be running, which I am sure you will not be surprised includes the part that processes your tax return and accepts your payment. One part that's not staffed during the shutdown includes -- oh, you'd never guess, not ever -- the people who issue your tax-return check. Yes, the Feds really, really want your money, on time and in full -- and they'll be keeping any extra you paid, thank you very much, until the Federal Government is running again. Hating on the IRS is like hating sharks -- they're just doing what they're fitted for, after all. Like the shutdown, the Internal Revenue Service is a creation of Congress. Congressthings keep on getting paid when the fed.gov is shut down, and they do want to make sure those checks don't bounce. Congress will muddle through. The military will get their back pay. If they can be patient, so can the rest of us. Except, of course, for the tax-collecting portions of the IRS. They're more like the tides. Tamara has kept this handy through several previous Federal government shutdowns. Today will be warmer, at least, and the chance of rain or snow is very low. So we might be getting some high, dangerous and expensive work done today. It depends on a couple of factors: wind and temperature. Surface winds aren't a trustworthy guide to conditions aloft. Windswept steel warms slowly, and until temperatures break freezing and stay there, whatever ice has formed remains. Worse, gloves thin enough for the kind of work we need to have done do not provide much insulation. So it's still undecided. I'll hear from the crew's supervisor in about a half hour. If he thinks the weather's good enough to send a crew up to check conditions, we'll proceed from there. That's a topic in and of itself, isn't it? Or is that cheating? -Fresh pico de gallo and chopped olives makes an adequate omelette filling. -There are few things that feel better on a cold morning or evening than a hot bath. If I ever get rich and add on to the house, a mildly sybaritic bathtub is near the top of the list. My first real apartment had a bathtub six feet long and nearly three feet deep and it seems like every place I have lived in since has had a successively smaller bathtub. This is frustrating. -That darned calf still hurts and my hamstring is noticeably tight. Gentle stretching exercises are in order. -If I don't stop typing and get in the shower, I'm not going to have time to buy a couple of donuts on the way to work. It'd be nice to have some at least once this week. It was a calf cramp, of course. Please, no quack doctoring; I know what causes them and how to deal with it. Comments are turned off. I knew I was a little dehydrated -- I worked up at the North Campus yesterday, where it is cold and dry; even the enclosed garage where I parked was at 20°F. My former office and workshop was somewhere between 50° and 62°, depending on which end you picked. The actual equipment rooms were between 65° and 70°, but very dry. Because of the extreme cold, I wore heavy boots, though I changed to sneakers for most of the day. Trudged through the supermarket in the boots when I stopped on the way home. So, dehydrated, muscle strain -- the surprise is that the cramp waited until 3:30 this morning to hit. I'm still limping around. The aftermath is probably going to linger. Yes, -3°F. It was warmer when I went to bed last night, but it must have been the wrong temperature for the radon-removal fan, which is on the other side of the outside wall from the headboard of my bed and which began to set up a terrible, ringing buzz right as I had almost dozed off. I thought it was the furnace. The replacement A coil for the air-conditioning last summer required replacing the entire air-distribution box on top of the furnace and as a result, the ductwork has picked up an entirely new set of sounds. The refrigerator, perhaps? It has its own set of sounds, some louder and more worrying than others. So I found myself shivering in nightgown, robe and sandals, standing on the back stoop in the well-below-freezing cold, listening to-- Yes, there it was, drifting around the corner from the open end of the radon vent tucked up under the eaves: a sound like a distant air-raid siren. It was late. I was sleepy. After an entire thirty seconds consideration, I decided the darned thing was either going to be okay, it was going to blow a breaker, or it was just going to fall apart and in any event, I needed to sleep and wasn't up tp just shutting it off. I went back to bed and ulled the covers up over my ears. This morning it's running fine, as quiet as ever. At -3°F. Maybe there was a desperate squirrel draped across the open end last night, or a flock of shivering, vibrating bats in the pipe. Yesterday was cold. The Indy 1500 Gun & Knife Show was in town, and our out-of-town friends, The Data Viking and Shootin' Buddy, headed to Indianapolis to go there with us. Tamara and I, that is. Cold day, snow on the ground: I wore my big, black Milwaukee motorcycle boots, with nice thick lugged soles. They're not light. We departed around 9:30 and stopped for breakfast at Good Morning Mama's, enjoying corned beef hash, breakfast burritos and various omelettes. And then off to the show! The State Fairgrounds were crowded. There was a big "Garage Sale And Marketplace" event as well as the Midwest Reptile Show (I hope they were bundled up!). We parked on the far side and walked a little over a quarter-mile, then walked the gun show with the slow and slightly sideways shuffle common to gun shows, farmer's markets, crowded flea markets and similar gatherings. About three-quarters of the way through, I realized my knee wasn't happy and my boots seemed to be getting heavier; I hurried through and found a chair where I could sit and wait for the rest of the party. Seen but not purchased: a number of Webley revolvers in both .455 and British ".38," also known as .38/200 or 380/200, which is really .38 S&W in UK military uniform. Alas, Webleys are usually priced out of my reach and these were no exception. At least one of them -- a civilian-model .38 in lovely shape -- was entirely worth the asking price. Also saw a Savage automatic in .380 ACP, which is the less-common chambering. In decent shape aside form some filing on the backstrap (! ), a replacement bottom on the magazine (I've had the magazine bottom slide clean off a Savage auto while shooting; it's a weak point) and good-quality replacement grips. That one was priced to move -- had I the price, which I didn't. It was a long, cold walk back to the car. We all went to the new Books & Brews in Broad Ripple for a late lunch. I had tasty chicken fingers; Tam and Shootin' Buddy opted for differing charcuterie plates and The Data Viking contented himself with a nice cider. By the time we got back home, I was exhausted. Laid down for a bit and fell fast asleep while Tam and The Data Viking chatted. Woke sufficiently to make civilized goodbyes and went back to bed shortly after. And that was my Sunday. Yesterday's writing class was indeed interesting, offering plenty of insight into generating solid characters and plots, using three flexible tools -- one to work out a premise and basic character,* one to get better insight into that character, and a useful "fifteen-beat" plot structure that at least provides a start on telling the story. The instructor was engaging and enthusiastic, which always helps. Outside of writing, she's a primary educator, which means (for us students) the bonus of a teacher with readable handwriting and excellent classroom skills. Add in what I took to be a certain joy at not having to limit her vocabulary nor skirt sniggersome terms and topics, and it was a remarkably pleasant class. And it was good material. Like any other approach to writing, it can become formulaic if followed too rigidly; but stories (mine, at least) tend to wander without some guide. My outlines have been sketchy to non-existent and that has been a source of difficulty. This may well help. The work stuff? I don't know. I haven't asked. They have my phone numbers. * Primarily a set of small-to-middling "what ifs," charted out in a manner similar to a mind map. Do this through even a few iterations and you'll have generated not just one story idea but several. So, to recap: I've got some Very Important Stuff presently operating under conditions that it should never, ever be subjected to. There's not a darned thing I can do about it, either, other than make adjustments to the thing that powers said Very Important Stuff, and which will have a negative effect on my employer's product. They will, however, not have as much effect as what will happen if the Very Important Stuff breaks. To add to the fun, the stuff that's not working is powered by transformers that run on three-phase electricity. The markings on the old ones may not be especially readable. The new ones must be connected exactly the same as the old ones. The new and old ones are not physically identical. So what am I doing about it right now? What I can: nothing. I'm going to go take a writing class. Perhaps I should think of the class as Plan B. Overnight, rain turned to freezing rain, with turned sleet, which turned to ice pellts and they, I'm told, are becoming snow. Possibly several inches of snow, and even more further south. Yes, south; it appears the weather patterns had swept southward and picked up moisture, which is now being dumped at such a rate that the larger amounts will be left before the wave of snow reaches Indianapolis. Traffic is every bit as bad as you might expect, except where it is worse. And the project I've been making vague references to all this week? I finally got men aloft early yesterday, during a break in the rain. The temperature at the ground was above 50°F. They were much colder at 800-some feet, where the wind was howling so badly they could barely hear one another or the walkie-talkie, but we did accomplish some trouble-shooting. Repair -- actually, replacement -- of the heavy devices I'd sent them up to look at was out of the question. About the time we reached that conclusion, it started raining heavier and the wind picked up, which ended further discussion. What those devices are and what they do, I'd better not say. But they'd sure be handy right about no -- not personally, but professionally. At least, it's nice for January levels of "nice:" temperature above 50°F, only a little wet, breezy but not windy. It's not going to stay that way. The next twenty-four hours call for a drop of over thirty degrees and a change to rain, freezing rain, sleet and snow. So of course the tower crew calls and wants to meet ASAP. These few hours are a window of opportunity. Not much of a window, but it's what we've got. So there was no tower work yesterday. Today, the chances are better, with ground temperatures well above freezing. I spent some time yesterday looking at pictures from a remote-controlled video camera well up on the tower, watching various-sized sections of ice break free and plummet down. It was nothing you'd want to be beneath at ground level and there was no way anyone would have been able to work safely on the tower. Today may be better -- but even cold, wet surfaces are dangerously slippery. And I may be working with tower climbers today. We'll see -- the weather is iffy and they may want to wait until tomorrow, when the high will be above 50. On the other hand, there's a better chance of rain tomorrow. Last night, I wanted something warm and filling for dinner. Even though the temperature was way up -- it passed the freezing mark in mid-afternoon and topped out around 35, which is really nice compared to -7 -- I was still feeling chilled. 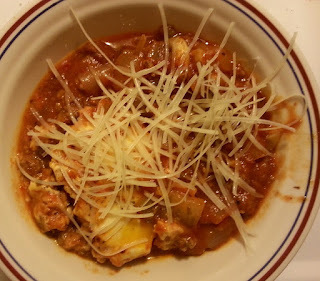 Something fairly simple, something I could make in one pot and be done with: Eggs Pomodoro. But not just any eggs-poached-in-tomato sauce. Nope. A half-pound each of ground sirloin and sweet Italian sausage, fresh mushroom, half an onion, a few cherry tomatoes and once that was all cooked, a bottle of "everything" spaghetti sauce. The resulting mixture is thick and meaty, and once you've poached eggs in it -- I like them nearly hard-cooked, which is barbaric but freezes okay for the next day -- and served it with shredded Parmesan cheese, you have a meal that will warm you up and remind why it matters. It's warming up and I should be happy. But the next 24 hours are very likely to include freezing rain and that, for complicated reasons that I can't explain right now, has the potential to make my life very exciting. Oh, I sure hope not. It's Three Above At 12:45 p.m. This weather is wretched. I do not think I will leave the house today. I must have strained my back lifting the old car battery out of the very restricted space it nearly filled. It was certainly heavier than I would have liked and my lower back has been sore ever since. The replacement has a handle, which was a considerable help. Yesterday I spent a fair amount of time in a room with no real heat -- it shares an air-handler loop with an electrical room, which is in the return leg and can usually supply enough heat to keep the space at 65 F or warmer. When the outside temperature is in the single digits or lower, that doesn't work. I wore heavy motorcycle boots most of the day to keep the floor slab from stealing all the warmth from my feet, and that wasn't especially successful, either. Now my ankles have become painful and uncertain. One way to fix the distinct lack of taste or mouthfeel of fat-free soup is to add some real meat. A cased chorizo sausage, snipped into discs, browned in a little olive oil and well drained afterward works very nicely for this, especially when you warm the soup in the pan you browned the sausage in and deglaze it with the soup. This is cheating, of course, but with age comes knowing when to do so. I'm here. I've got to go work at the North Campus, if they have plowed the lane, and that place has been a lot less nice since the Great Mouse-Ruining in 2017 and the woefully inadequate clean-up that followed. I'm going to take the time (and spend the money, which I may or may not get back) to buy cleaning supplies, clean up the kitchenette and replace the microwave (yes, they got in it), because I have to work there and it has become painfully obvious that our (extremely understaffed) custodial department can't. What the heck, I already removed and disposed of all the kitchenette supplies and such when I originally found the problem, figuring I could help 'em out a little that way. Fat lot of good it did -- they didn't even move out the fridge and clean under it until I moved it, saw untouched and very thick mouse-mess, and rang them up to very politely ask if they would not mind, perhaps, making a second try? That was met with the kind of cheerful enthusiasm you might expect from a surly teen-ager told to clean his room. I suppose I'm just a fussy old lady, and everyone else is perfectly okay with a yellow-green stained floor under a dense collection of, ahem, "solid evidence" in their break room -- one wall of which is formed by the access doors of the cabinets of the equipment I'm going up there work on. The new car battery can't possibly be the right physical size. Got it clamped down and it wasn't, quite. So much for fancy online find-the-right-battery software! Connected the terminals and started the car anyway, then spent far too long improvising with some leftover oak trim to ensure the battery would stay put,* a loose lead-acid battery being something you never, ever want under the hood. Electrical capacity is right and it's too darned cold to be fussy. I'll do something better in the Spring. Clamping nuts on the terminals take a 10 mm wrench, the size 3/8" won't fit and 7/16" ruins, so I used a combination (box end/open end) 10 mm wrench like I was some kind of savage. I have a set of standard and deep-well 1/4"-drive metric sockets on my Amazon wishlist now, waiting for the next time I am flush with an extra $32 American. --Not that Craftsman sockets are made here any more. * Growing up in a small town and keeping cheap cars running on a budget, I am no stranger to improvising mounts for a wrong-sized battery -- because that's all the auto-parts place had at a price I could afford. I had feared it. But I hadn't feared it enough: my battery was, indeed, just about dead yesterday. Won't turn the engine over. Yesterday, I bought a battery online, and Tam and I picked it up when she drove me home from work. It made for quite the trip: my briefcase fits in the Zed Drei's trunk, but that leaves me with a lunchbox and oversized purse in the cockpit. Add an SUV-sized battery on the floorboards, and you'll be as happy as I was that it's only a couple miles from the auto-parts store to home. Good thing we didn't encounter any turbulence! There's a nice streetlight in the alley at our garage. So nice that I pay for it; the city doesn't routinely light the alleys. On the other hand, the cost is nominal and it was already in place when I moved in: six bucks a month for a lit-up parking spot? Yes, please! However, I had parked facing in, the light is behind my RX300, and even with light from the garage, between the dark and the cold, last night all I managed to do was get penetrating oil on the hardware holding the battery bracket and eventually get it loose and out. Discovery that A) the rear fastener is one of those @#$%^ J-hooks you have to fiddle with on reinstallation until it starts to get a grip, B) my eyeglasses were fogging up every time I looked down and C) there wasn't enough light to see to get a wrench on the battery-post clamps, let alone find the right socket, made me decide to wait for daylight -- because while those nuts ought to be 7/16" the way the gods intended, the RX300 tends to break out in metric given half a chance. For example, the battery-bracket hardware is 10 mm. I have nothing against this; the various cars and other vehicles I have owned through the years have used SAE, metric, BS, BSP and possibly Whitworth and I have a pretty good set of wrenches and sockets -- except for what I may need here, little 1/4"-drive metric sockets. Worse, my smallest 3/8"-drive socket set is all 12-point, a nice way to round things over if you don't have the proper size. But second chances are few when it comes to battery-clamp hardware and fighting in the extreme cold and moderate dark with fasteners of uncertain size struck me as a recipe for problems. I gave up and went to bed. Sunrise is in just under an hour. Hoping to just do this, with a minimum of whateverthehellitisitis* and fuss. It's -11°F this morning. Nearly -24°C, if you prefer. I'm not impressed. Cold air pours out of the electrical socket where the fridge is plugged in, as though it had started to back up and send cold down the wires. Such is my dislike of the cold, my car has sat for two days and there's some question in my mind if it will start. So I'm going to try -- try! -- to get an early start myself. Later: Nope. Dead battery. Messed with it for too long, then had to beg a ride to work from Tam. Bought a replacement battery but cold and dark stymied me tonight after (eventually) getting the bracket out. So, fun project tomorrow morning! Oh, yay. Presently -- 11:35 a.m. EST, about 10:46 a.m. as the Sun flies* -- it's -4°F, down from three below when I hailed my lazy self out of bed at 9:00 a.m. Today's predicted high is three above (three above!) and we might not actually get there. Welcome to 2018. I'm not going outside unless I absolutely have to. * Thanks to the halfwits who think it is cool and exciting to be New York City time, ooooh. So by the Sun, we're on Daylight Savings Time all Winter and double-Daylight all Summer. I think Wednesday is triple-Daylight-coupon day but where would you turn them in?